Students participate in a mock Israeli checkpoint stop near The Rock on Tuesday. 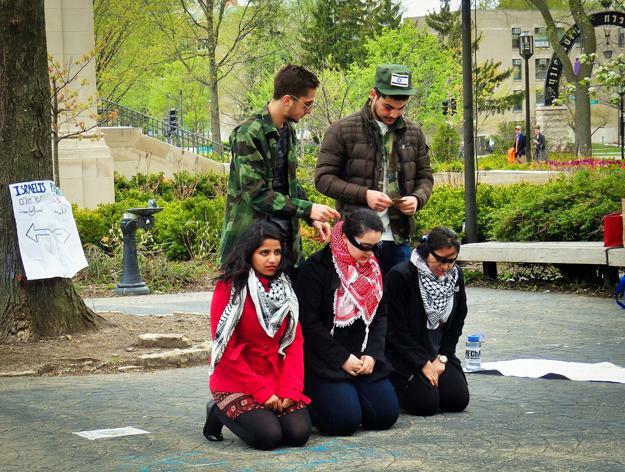 Students for Justice in Palestine and MEChA de Northwestern organized the demonstration. Students for Justice in Palestine held a mock checkpoint and border patrol event at The Rock on Tuesday, symbolizing the Israel-Palestine and United States-Mexico borders. One student said he filed a hate and bias incident report in response to the event. The event, which was part of SJP’s Israeli Apartheid Week, featured demonstrators in camouflage gear acting as patrol agents. Depending on the scenario, the camouflage gear featured an Israeli or an American flag. Students acting as migrant workers carried water jugs and those acting as Palestinians wore a keffiyeh, a Palestinian scarf. Khokher, an SJP member, also discussed how the event aimed to show how similar companies are involved in both patrols, namely Elbit Systems and Hewlett-Packard Co. The companies are two of the six corporations that Northwestern Divest called for the University to divest from in a resolution passed by Associated Student Government last quarter. The resolution’s sponsors say the companies are involved in the violation of Palestinians’ human rights. SJP collaborated with MEChA de Northwestern on the event and Cinthya Rodriguez, a member of MECha de Northwestern, said the event used performance art to further the conversation on how people’s movement is policed in the two locations. “It’s really about making the connection between the systems of regulation that are happening there in both spaces and thinking about what this means for people in these two parts of the world,” the Weinberg junior said. A Jewish male sophomore filed a harassment and verbal assault complaint through the Respect NU system for bias against race and religion in response to an incident at the event. In the report obtained by The Daily, the student said he was videotaping the mock checkpoint at around 2 p.m. Tuesday. He requested anonymity because of the sensitive nature of the bias report. A video obtained by The Daily shows two students involved in the event asking the sophomore if he wanted more information about the demonstration, to which he responded, “No, thank you.” After declining a pamphlet, he told the students he was sending the recording to his friend in the army, the video shows. “Another girl right after got in my face and said, ‘You’re sending it to killers, great,’” he told The Daily. The sophomore said he stopped recording 30 seconds in and was approached by a different student offering pamphlets. After declining and walking away toward The Arch, she allegedly pursued him and continued to offer him a pamphlet for about 15 feet, he said. His friend is a 21-year-old female medical student in the Israel Defense Force, and he said she hopes to save civilians regardless of ethnicity. The student wanted to show her the video to inform her about developments happening on NU’s campus, he said. The report alleges the student felt the act of calling his friend a killer was harassment and made him feel uncomfortable being Jewish on campus. He told The Daily that Jewish students are unfairly labeled as racist, even though many support a two-state solution, including himself. “Me taking a video was a very non-partisan, observational thing,” he said. Iszy Licht, a member of J Street U Northwestern, said he stopped by the demonstration. Licht said although he agrees with the idea of the event, it does not address solving the Israeli occupation itself. Khokher, the SJP member, said she was not surprised someone filed a complaint, but she said she could not comment on the specifics of the incident because she was unaware it occurred. She said students were only offered flyers once. Khoker emphasized the event should not be viewed in isolation, but rather in the context of Israeli Apartheid Week. The week consists of various events aiming to educate students about Israel’s policies toward Palestinians and to build support for the Boycott, Divestment and Sanctions movement, according to the Facebook event page. “I would encourage everyone to stop by and really listen to what we’re saying,” she said. Correction: Due to incorrect information from a source, a previous version of this article misstated the age of the Israeli medical student. She is 21 years old. The Daily regrets the error.